It's time for the largest indoor agricultural exhibition in the country! The 96th Annual Pennsylvania Farm Show opens on Saturday, January 5, 2013. See the schedule of events and plan your visit to see animals, check out the crop displays, and of course eat some wonderful PA Preferred foods! If you're a "foodie", the food court at the Farm Show is the first place to stop! Try the Honey Ice Cream from PA Bee Keepers Association. It''s THE creamiest ice cream ever! Enjoy a big PA baked potato from the oldest potato growers association in the country - the PA Cooperative Potato Growers, Inc. The list goes on -- vegetables, beef, pork, poultry, fish, mushrooms, and don't forget PA Maple products! All of these PA Preferred foods are ready for you to enjoy at the Farm Show. One of the annual favorite demonstrations and competitions is the "Sheep to Shawl" contest. It will take place on Wednesday, January 9th in the Small Arena. See horses, cows, pigs, goats, chickens, llamas, and Alpacas. Learn about farming in PA and talk to some producers and educators about the Agricultural industry in PA.
We still have rooms available during Farm Show Week! 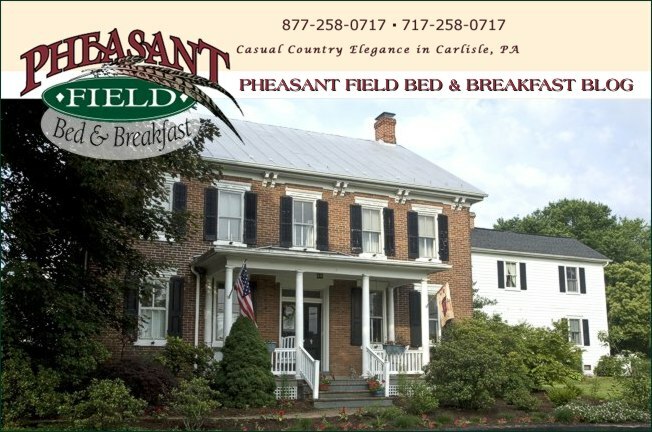 Stay with us to experience a Farm B&B in PA.